Nicole Holland was born in Canada and moved to Maryland, where she grew up. She lived in Germany and many other places, moving around a lot, getting bored quickly and moving on. Before she decided to become an entrepreneur, she was a correctional officer. The job was a tough one, taking its toll. Working with rapists and murderers every day was tough. She was miserable, hated her job, and ultimately she got very sick. When Nicole decided to start her own business, she didn’t have an online presence – didn’t even like the internet. But she wanted out of the life she was living, and to do that she would have to jump in with both feet, deciding that she was going to live the life she dreamed of living, on her own terms. And that is what she did. Nicole built her business, being the connector and the advisor to entrepreneurs and “wantrepreneurs” all over the world through her online summit, her highly-regarded podcast, “Business Building Rock Stars Show”, and some other programs and resources that she created. She was named one of “50 MUST-FOLLOW WOMEN ENTREPRENEURS IN 2017” in The Huffington Post alongside Marie Forleo, Amy Porterfield, Dorie Clark, & many other female powerhouses. After interviewing over 220 high-achievers, Nicole has learned a thing or two about what makes interview guests stand out – in both good and bad ways – and how to consistently turn listeners into leads. 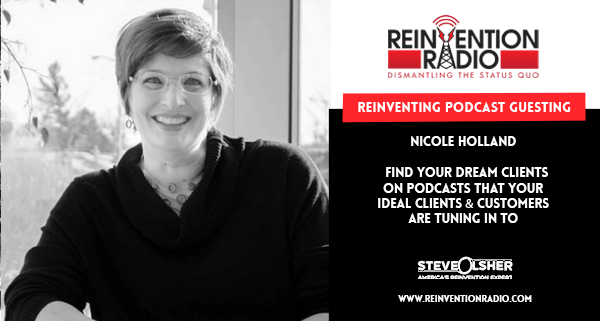 TUNE IN to this episode as Nicole chats with Steve, Mary, and Richard about finding your dream clients on podcasts that your ideal clients and customers are tuning in to. @Niczthename offers tips for being a great podcast guest. Reinventing Your Mindset – In this episode, Martin Lucas chats with Steve, Mary, and Richard about the science of making people act and how to make the complex, simple. Thanks so much for having me on!! I appreciate you. You’re welcome, Nicole. Thank you for being our guest and sharing all your expert advice! The timing and content of this show couldn’t have been more timely for me! So much great content in 30 minutes – I’m so glad I tuned in and took lots of notes. Sharing this episode with all of my entrepreneur and author friends. Thank you, Reinvention Radio and Nicole Holland for sharing your genius so we can all create the best experience for those who need our support. Also, thank you to Jesse Krieger for referring me to the show! Hey Denise – I’m so glad it was of value to you! Denise, thanks for tuning in and for stopping by to share your experience. We appreciate you sharing with your colleagues, too.